This muscular and medium-sized breed is typically fearless, alert, and powerful. The Thai Ridgeback is extremely agile, athletic, unique, and graceful. They are very sensitive to both sight and sound. They are a magnificent and courageous breed, and are highly capable of adapting to any new environment. Highly intelligent, loyal, and deeply devoted, the Thai Ridgeback is a faithful companion and fierce guard dog. They are aloof and wary of strangers. This breed does best in a home with older considerate children. They do not get along well with other dogs or other household pets they have not been raised with. They are exceedingly protective of their family and will display aggression toward anything or anyone they perceive to be a threat. Thai Ridgebacks do not do well if left alone for extended periods of time and are not suited for a two-career family. The Thai Ridgeback is not recommended for the novice dog owner. The Thai Ridgeback requires weekly grooming and care. The coat needs to be brushed and combed on a regular basis to remove dead hair. Bathing should only be done when necessary. Special attention should be given to the eyes, ears, and teeth. They do not tolerate cool climates. The Thai Ridgeback is a relatively healthy breed, although they may be prone to hip dysplasia and dermoid sinus. The Thai Ridgeback coat comes in two distinct varieties. The first type consists of a hard, short, and straight outer coat with a very thin under coat. The second type consists of a short, dense coat that has an appearance and texture of velvet. A distinguishing feature of the Thai Ridgeback is the ridge of hair on the back that runs in the opposite direction of the coat. There are eight distinct ridge patterns: bowling pin, leaf, saddleback, needle, feather, arrow, lute, and violin. The color of the coat comes in blue, red, fawn, and black. This breed is light shedding. Thai Ridgebacks require formal obedience training as well as intense and extensive socialization. They are generally quick to learn, obedient, and eager to please their master. Training must be done with love, respect, firmness, fairness, consistency, and patience. This breed excels in agility. The Thai Ridgeback thrives on exercise and stimulation. It is extremely important that this breed does not become bored, as they will be highly destructive. They will do okay in an apartment dwelling provided they receive sufficient exercise. 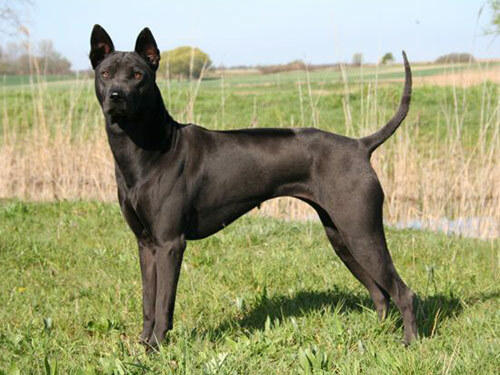 However, the Thai Ridgeback does best with a large yard where there is ample room to romp and run. It is crucial that yards be safe, secure, and have a very high fence. They benefit from going on securely leashed walks, and enjoy all family activities.